I saw your ad on Craigslist for the Scenic Antler Sculpture http://newyork.craigslist.org/lgi/hsh/2142504721.html. 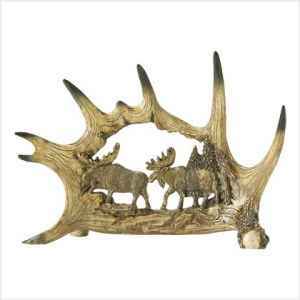 In your ad you say, "From the heart of a cleverly fashioned replica antler, an intrinctly carved panel depicts a moose and his mate as they traverse a tranquil forest glen". Don't you worry that displaying this will send a message to the other mooses that it is ok for them to choose this type of lifestyle? Next thing you know they will want to get married and then there goes the sanctity of traditional moose marriage.